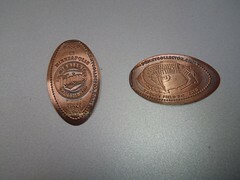 At Target Field there is a Penny Smashing machine in the Main Team Shop near the registers. 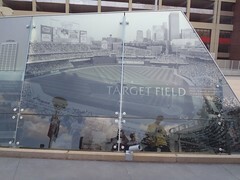 Mik and I both got the design featuring Target Field. 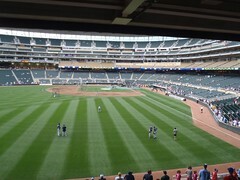 I also got the one with the Twins logo. 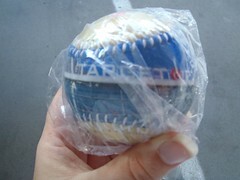 At Target Field I was able to get a ball featuring an image of the Target Field plaza entrance. 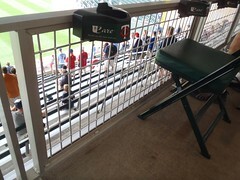 It also has the Target Field logo and the Twins logo on it. 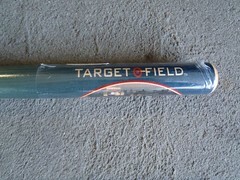 Mik was happy to find a Target Field mini bat. 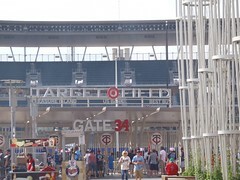 It is the same ballpark image design style that several other ballparks sold, so not exactly unique other than it shows Target Field instead of another field. 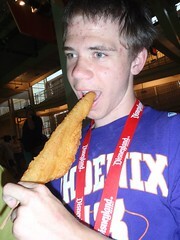 When I saw they had Walleye on a stick at Target Field, I had to have it, as Walleye is my favorite fish. Mik had to have the first bite, though. 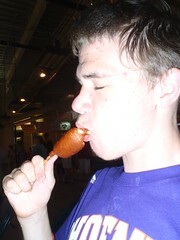 He liked it, but he really loved the Corn Dogs. He had one before the game and had Dad go back and get him another near the end of the game. 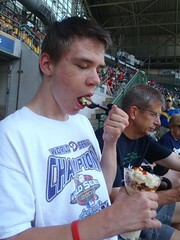 Mik had high expectations for this ballpark with it being new and he was not disappointed. We did not do parking, so not sure how the parking garages are set up, but walking from the Hyatt (about a mile) to the ballpark worked out very well. Supposedly, you can get everywhere around this area of Minneapolis through the Skyway, but we walked on the Street Level. 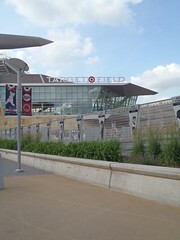 It is nice that when you approach on 6th Street you end up walking over the freeway on the nice Target Plaza that connects Target Center and Target Field. 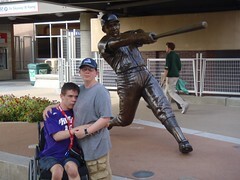 Target Plaza includes some statues of great Twins players such as Harmon Killebrew and Kirby Puckett. Interestingly, they also have concession stands out here that were open before the gates opened, although you cannot leave the park and come back in during game I do not think. From the plaza you can only walk around to the left or so we were told (map looks like you can maybe cut through parking garage to Gate 3). 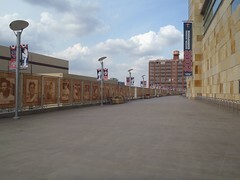 It is definitely worth going around the park at least until you get to the Team Shop corner, as around here the walls across from the park have the Twins Hall of Fame. There is also a cool memorial that shows the history of ballparks in Minneapolis. From here there is not much reason to keep going around the ballpark unless you want to enter at a gate closer to your seats, although the side opposite Target Plaza does have some fun old baseball card style banners of former Twins players. 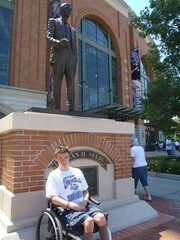 The first thing we did when we could go in the ballpark two hours before the game was go to the Team Store. We barely ventured in, but were able to get a mini bat and ball, as well as get over to the penny smashing machine. However, getting through the checkout line was sort of a pain with the wheelchair. The dividers are placed too close together to fit, but at least they are movable. We had to keep moving them to get by and then we would wind back and have to move them again, so the next wheelchair going through would still have to arrange as they went through. The worst is once you check out, it is hard to get out with there being like no room to get past others checking out. Thus you have to wait for them to be done and at the same time you are holding up the line because registers open up and people cannot get past you to them. Bottom Line is Mik recommends skipping the Team Shop and hitting one of the several little souvenir kiosks out on the concourse, as they seemed to have most of the same stuff, which sometimes is not the case. The Team Shop mainly seems to only have a wider selection of apparel. 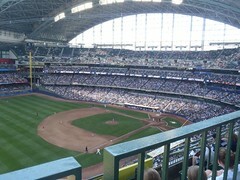 For the game we sat in section 129, which is part of the Right Field Bleachers. 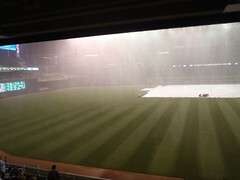 The view of the field was great, but you cannot see the scoreboard at all. 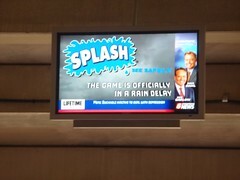 However, they do have televisions mounted here, which is kind of cooler, especially when they played other games going on around the MLB during the rain delay (played on scoreboard, too). Mik likd the seats because they were way above the section, so no possibility of someone tall standing up and blocking the view. 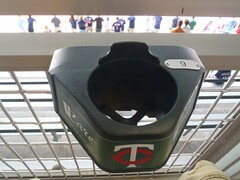 What he really loved, though, was that there were cup holders for the handicap section, which the rest of the bleachers do not get. Mik did not entirely enjoy the section, though, because the standing room only divider is just a blue line painted on the ground and the game had a lot of standing room people. Most respected the rules, but without a rope or some sort of real divider who can blame them for inching forward. However, it is not okay when they ended up being right behind us, especially when one guy ended up spilling his beer onto the girl next to us and then proceeded to yell into our ears and touch us to try to get us to join his stupid yelling to get the attention of the Brewers outfield that he was actually a fan of when the game was going on. 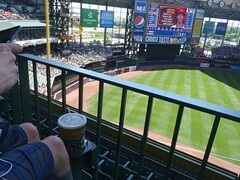 Dad got him to go away and customer relations later even offered us hot dogs, which we did not want, but were happy they were doing their job and trying their best to have everyone enjoy the game. 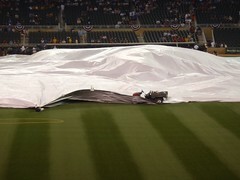 After a 2 hour rain delay, the Twins game finally started around 9pm on July 1, 2011. It was an extra late night of baseball, but at least we can again say we have seen a complete game at every current MLB ballpark. 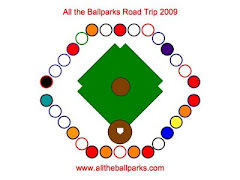 Of course, next year we will have to catch up again with the new Marlins ballpark, but we are already working on planning that into our 2012 summer vacation. It was a rather long wait for the game to start including a decent amount of time with no rain. However, it made sense to wait out the storm, as there was a major thunderstorm including hail. Much better to wait it all out and then have the whole game instead of the stop and start that sometimes happens. 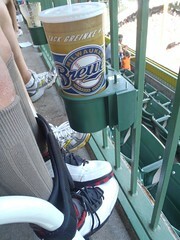 Of course, this is one reason why the MetroDome was better. Overall Target Field is a better ballpark, but Mik seriously wants to know why a team would go from a roofed stadium to absolutely no roof. The game went pretty quick once it started. Ended up with some very rude Brewers fans that would not stay behind the blue line for standing and even spilled their beer on the girl next to us. Then he was touching us and yelling at the outfielder basically right in my ear. Dad got him to go away and customer relations later even offered us free hot dogs, but we did not feel like taking advantage of that when customer relations did there job and really made efforts to have everyone enjoy the game. I got nothing wrong with people cheering, but for one he did not have a ticket for the wheelchair section and it makes no sense to be yelling to get the attention of an outfielder during play, especially when it is the outfielder for the team you are rooting for.